It’s an event that’s become mythologised, Moseley was able to carry on recruiting and indeed marched again within the week. A year later an equally large march was met with similarly fierce opposition in Bermondsey. It was one battle in an ongoing campaign, fascism isn’t that easy to put down. Anti-fascism is never just ‘the big demo’. On the 4th October 1936 , tens of thousands of anti-fascists turned out to stop Moseley’s Blackshirts marching into the East End of London. The EDL had a pitiful turnout in London on Saturday, with a mere 50 of them on their national demo. They didn’t get to march to Parliament as they had intended and were harrassed and heckled by anti-fascists along the way. EDL leader Ian Crossland had gloated and joked online about the murderous racist attack on worshippers at Finsbury Park mosque and the hate preachers at the EDL rally stayed true to form. September is shaping up to be a VERY busy month for Antifascists. There are going to be three (!) AFN actions, alongside several other non-AFN Antifascist demonstrations. The refugee crisis has pushed the far-right into a frenzy of activity and it is our social duty to combat them. Prompted by the death of a 13 year old boy in the Channel Tunnel. Folkestone United called a demo in solidarity with the Calais migrants on Saturday calling for “no more tunnel deaths”. Fascists from Britain First and the EDL both decided to turn up to oppose it. That’s right – they were opposing people who thought children dying in the Channel Tunnel was a bad thing. Because they only oppose militant Islam remember? Britain First members tried (and failed) to physically attack the Folkestone United demonstration. 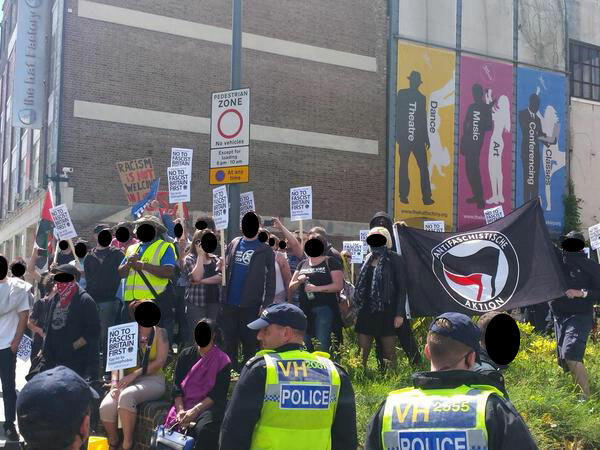 “Thanks for all the anti-fascists who turned out yesterday to oppose the fascists Britain First and to show solidarity with Luton Antifa’s first action. This is just the first step in setting up a militant anti-fascist movement in Luton to rid our town of the disease of fascism. Today as a group we forced Britain First to retreat and divert from their planned route, so thank you again to everyone who stood in their way and would not let them pass. Please contact us via the page or email (lutonantifascists@riseup.net) to get involved with further meetings/actions. Britain First are meeting at the train station at 1pm. The planned route of their march is shown above. At time of writing the leaders of Britain First are in the High Court disputing a police injunction banning them from Luton. It remains to be seen what will happen if the police are successful and they are banned from their demo. Watch our twitter feed for the latest info. Anti-fascists should assume the fascist march will still go ahead. The High Court has not supported the police’s attempt to get Britain First’s leaders banned from Luton. We can expect the fascist march tomorrow to go ahead as planned. Details of the anti-fascist mobilisation remain unchanged. 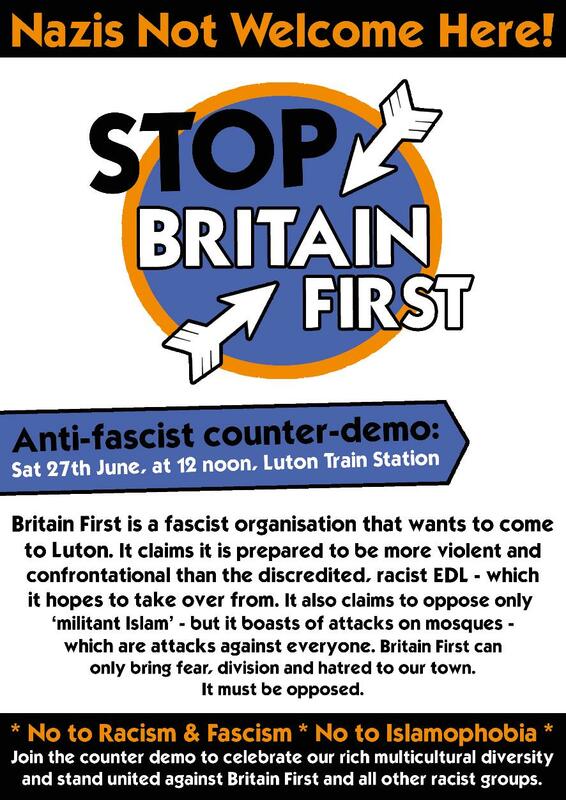 This Saturday 27th, fascist BNP splinter group ‘Britain First’ are planning on marching through Luton, which apparently they think is a “mini-caliphate”. They aim to harass and intimidate the Muslim population of Luton and to whip up racial tensions in the town. 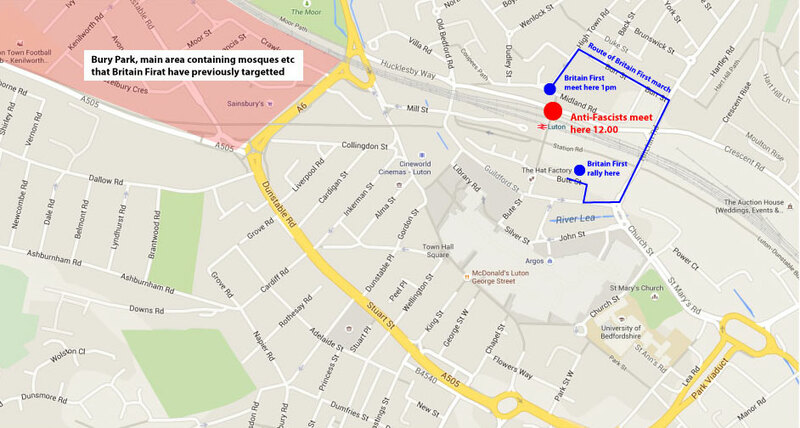 Luton UAF and the newly-formed Luton Anti-Fascists have both called counter-demonstrations. 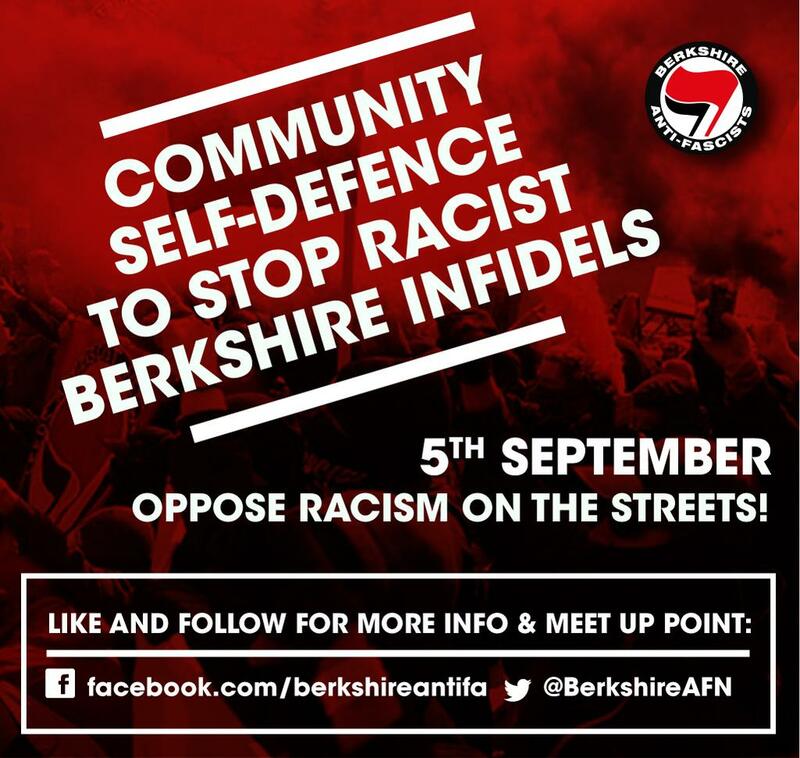 Members of the Anti-Fascist Network will also be attending. Join us on Saturday!